I've been trying to get a good shot of the milky way, but I can't get the focus right. I would appreciate any tips on how to get it as sharp as possible. The camera is a Nikon D3100 with the 18-55 lens shooting at 18. This is a 30 second exposure at ISO 1600. When I blow this up the stars are doughnuts. Also, will I need to stack images to really make this work? Advice on any aspect of getting this kind of shot would be appreciated. How long of exposure are you using? You need to remember that even a 10 second exposure is going to show some movement in the starts as the earth rotates. It also looks like there is allot of ambient light pollution going on it that photo. You need to get as far away from city lights as possible. Instead of me explaining it, this video will do it a lot better. Secondly, set your lens/camera to manual focus and set the lens focus point to infinity. Lock the mirror up. Place a small bag of shot on the camera and lens. Then make your exposure. Your image appears to be a bit too long of an exposure complicated by not accurately focusing. How long of exposure are you using? You need to remember that even a 10 second exposure is going to show some movement in the starts as the earth rotates. It also looks like there is a lot of ambient light pollution going on it that photo. You need to get as far away from city lights as possible. Thanks for your input. I know there is a big problem with ambient light here. I'm shooting in my back yard trying to get the settings nailed down before I start looking for darker sky. With the 18mm focal length I'm not seeing any distortion because of movement even at 30 seconds. Once Iget this focus thing figured out I can start to refine exposure, etc. Best of luck photographing the stars! I'm no expert having only tried star shots a few times, but I've read in a few places that setting your camera for monochrome/black & white can be helpful. Hopefully someone more knowledgeable can chime in. You need your lens on its widest aperture, I am guessing it is probably 3.5. Probably increase your iso as much as you can without getting noise. 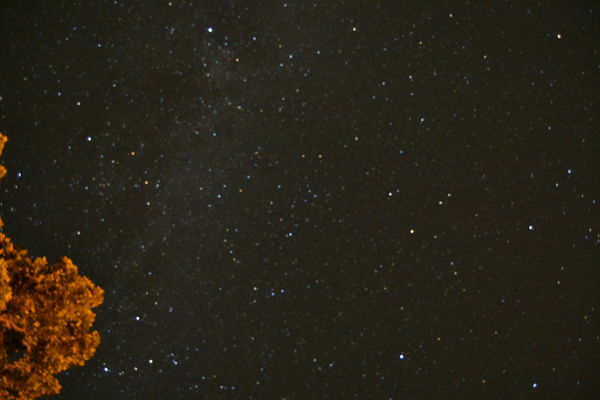 Also, can you actually see the milky way from your backyard? I sort of got a not great Venus with a crescent moon a month or so ago, but mostly not much of anything is very visible from my backyard. I have to work on the settings in the dark sky area. Rule of 500 would say you your exposure should be no more than 18 seconds at 18mm focal length - 500 / (18mm X 1.5 crop factor) = 18.5 seconds. That should help, but your sharpness may be limited by coma aberration. Rokinon have some reasonably priced lenses with particularly good coma. For focusing, I just use focus peaking on my A6000. The edges of the bigger stars will light up fine. Alternatively, focus on something far away in decent light and tape the focus ring to lock the position. I hope that somewhere in the above links and advice somebody mentions that you shouldn't just adjust the focus ring to its extreme position. You need to focus visually and manually (not with auto focus). The extreme position of the focus ring will NOT give you the sharpest focus at infinity. That is especially true of the Rokinons. The focus ring on my 12mm F2.0 goes a full notch past infinity. To infinity and beyond - that's just showing off, isn't it? Yep - the lens is really 'out of this world'!! I totally agree with Bob's assessment. You can't shoot this in auto focus period, there's not enough light to auto focus.